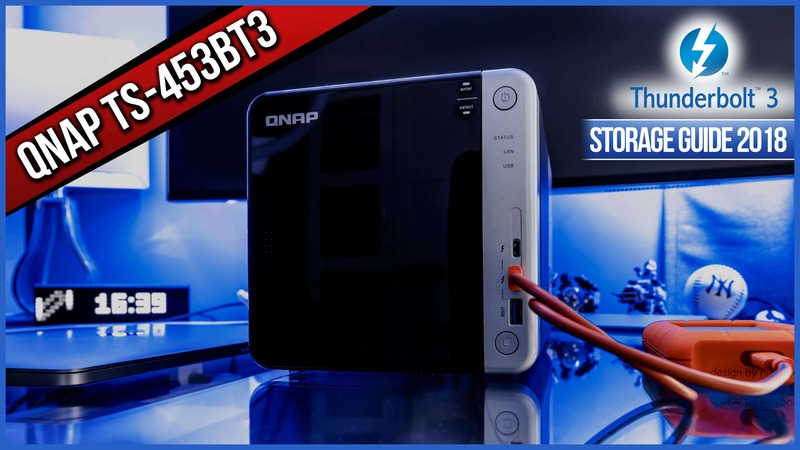 The TS-453BT3 is QNAP’s Thunderbolt 3 entry Level Storage Device. Last week i tested the Drobo 5D3 which is one of the cheapest available Thunderbolt 3 Storage Solutions. In today’s review we’ll find out, if the TS-453BT3 is actually better than the Drobo 5D3. These two device are similar in many ways and very different at the same time. The 453BT3 isn’t just a Thunderbolt 3 Storage. For its size it’s a Entry Level NAS on steroids. The Connectivity and the Feature List quite impressive. At the moment I’m not aware of any other vendor who offers two Thunderbolt 3 Ports, two 1 Gbit Ports and even a 10 Gbit Port in one single device. Paired with it’s Processing Power the QNAP TS-453BT3 can handle almost everything you throw at it. With the help of QNAP’s Operating System called QTS, you can extend its capabilities in a modular way. From Virtual Machines, all the way to DHCP and VPN Services. This enables this little system to take care of all kinds of Services and makes it a pretty good allrounder for a Small Office Environment. From a physical standpoint the 453BT3 has a small footprint and can easily be operated in silent areas. It reaches a noise level around 43 dB with 3 installed Disks. If you are planning to use it as a NAS only System this shouldn’t be an issue. As a direct attached Device it could get a bit distracting. Don’t forget there are only 2m Thunderbolt 3 Cables available so you’ll have to stay close to it. When it comes to the Connectivity, you should know, that QNAP is utilising the Thunderbolt 3 Connection a bit differently. Thunderbolt 3 is an incredible interface. The Thunderbolt 3 Standard offers a bandwidth of 40Gbit. This not only offers you the capability to daisy chain all kinds of gear, it also enables you to charge your equipment, transmit an HDMI single, Audio, Network Connectivity etc. Most Thunderbolt 3 Storage Devices will show up as a direct attached device on your computer like a good old USB Drive. Not the QNAP Systems. They are using the Thunderbolt Connectivity to establish a 10Gbit Ethernet connection. Such a connection tops out around 1250 MB/s. The Limit for a Thunderbolt 3 connection is somewhere around 5000 MB/s. This leaves plenty of room for most people at this time of history. 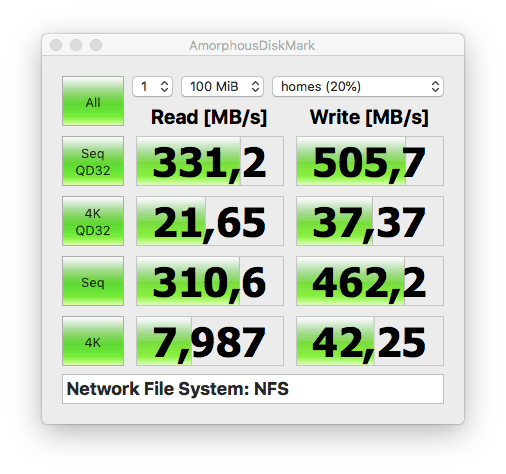 To give you an example, NVME SSDs (fastest available SSDs at the moment) reach 3200 MB/s in Read and 2000 MB/s in write speeds. QNAPs Solution unfortunately comes with a catch. 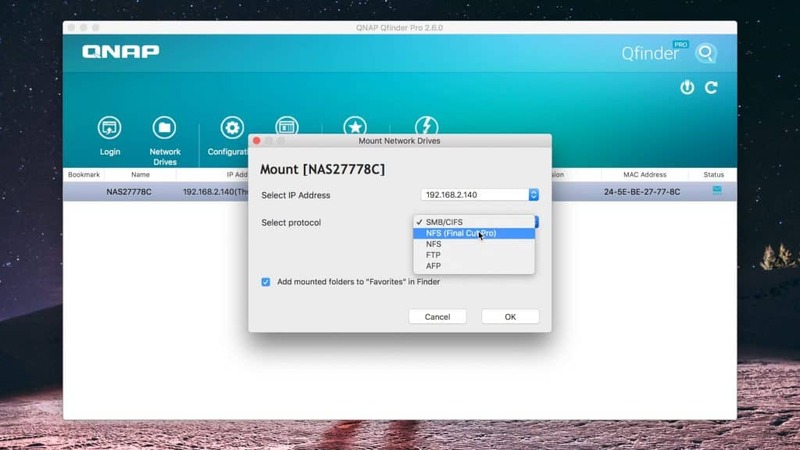 You have to mount the Network share you want to access. This also involves that you have to know that there are Network Protocols like NFS, CIFS, AFP and SMB. These protocols have a huge impact on how the files on your TS-453BT3 are accessed. To cut this short, if you are going to is as an Video Editing device, I’d recommend you to use the NFS Protocol. So there is no plug and play ease of use with QNAPs Thunderbolt 3 Systems. Fortunately QNAP is aware that not everybody is firm with Network Protocols and doesn’t know how to mount them properly in different OS Environments. To help us with all of that they supplied us with the QNAP Qfinder. 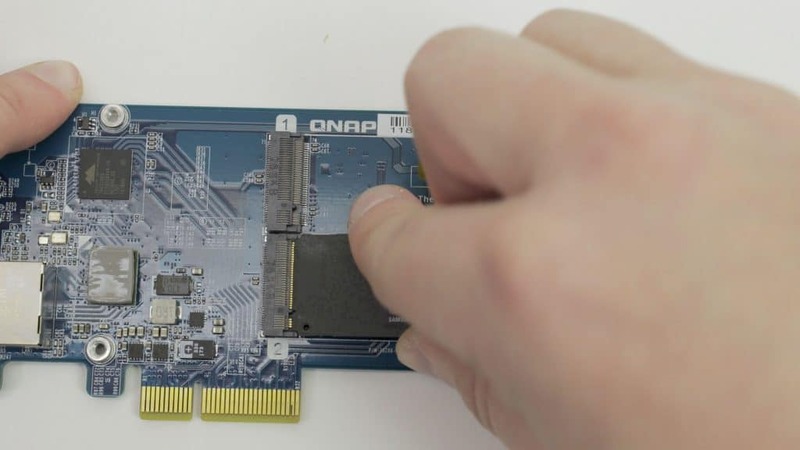 This handy tool takes care of the connectivity with your QNAP System for you. It automatically discovers any QNAP Device in your vicinity and the wizard then takes care of the rest for you. The possibilities don’t end here. You are also able to extend your whole setup with up to two M.2 SATA SSDs on the 10Gbit Ethernet Extender Card. But be ware! Even though the slots look like they could facilitate a M.2 NVME SSD they can’t. 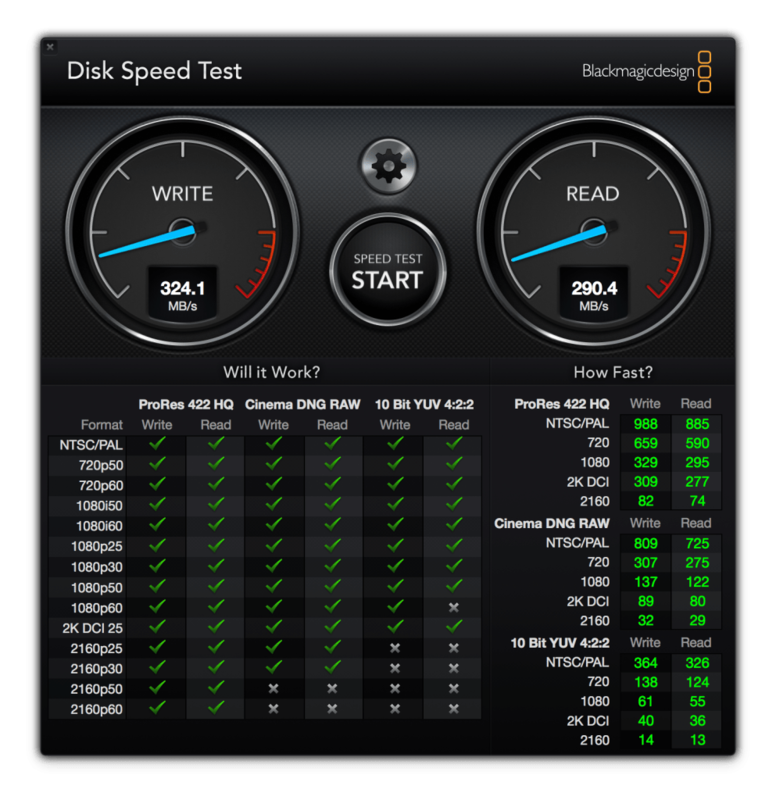 The Disks used in this benchmark are the same that were used in last weeks Drobo 5D3 Review. It was interesting to see how the same drives led to different Benchmark results. The Storage array was set up as a RAID 5 with static Volumes to achieve the highest possible performance. And here is the first big difference to the Drobo Storage Systems. You have to know what all these terms mean. If you are a Creative Professional you may have a hard time to get a hold over all these terms and their effects which could be intimidating in the beginning. The Drobo on the other hand is a fire and forget solution, while the QNAP Systems give you wide variety of possibilities. Just a personal side note: Maybe QNAP could introduce a Easy Setup Wizard that focuses on people who don’t have an IT Background. Another difference is the way QNAP handles installed Drives. You need to use the same Drive size for a RAID Set otherwise the smallest Drive will define the size of your Array. At least QNAP offers a migration mode, where you have to replace every single Drive with a bigger one. These values differ quite a lot from last weeks Drobo 5D3 Review. It even gets more interesting the moment you throw in the Real Life Benchmarks. 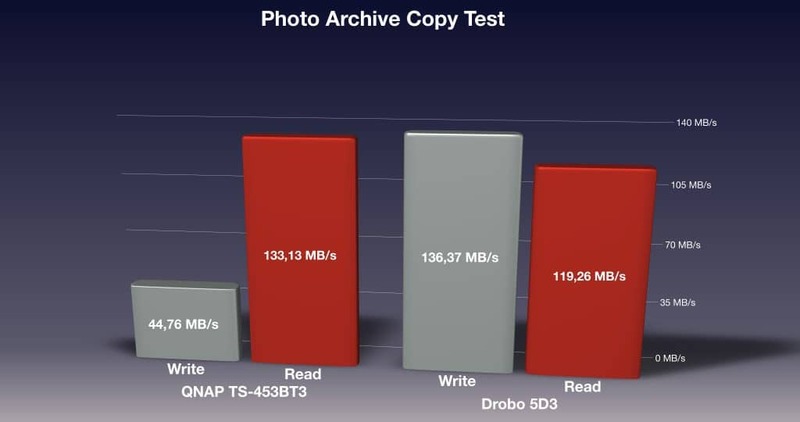 The QNAP TS-453BT3 outperformed the Drobo 5D3 almost in all results. But with these results also a very interesting fact surfaced. The Drobo System seem to be optimised for Photographers. It outperformed the write speeds of the 453BT3 by a factor of three. 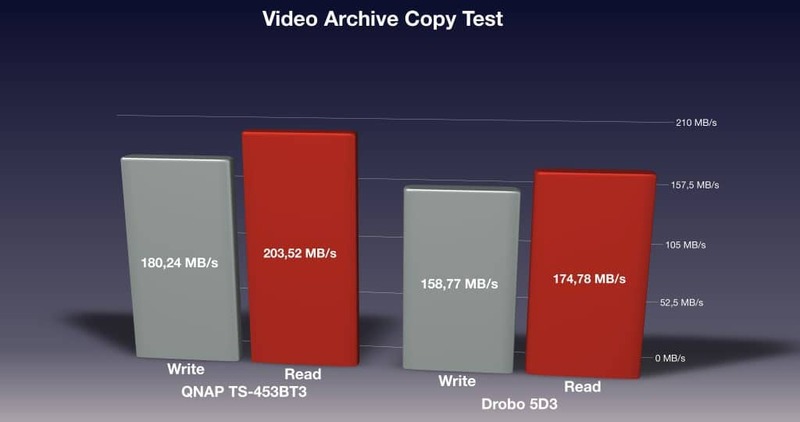 On the other hand the QNAP performed way better with Video Files then the Drobo did. It would have been interesting to see how the QNAP TS-453BT3 performs with two SSDs set up as Cache. Unfortunately I didn’t have any supported M.2 SATA SSDs at my disposal. Maybe QNAP would be interested in supporting me on this one. I also conducted the Rendering Test of the 4K 14 minute Video File and took 17:02 min to render out. This makes the QNAP 16 seconds faster than the Drobo 5D3. At this point it almost seems that the Macbook Pro Late 2016 is the Bottleneck in this equation. In the next Review you’ll see that a faster Storage Device actually still can decrease the Render Time but more about that in a few days. So what is my overall verdict about QNAP’s TS-453BT3 at this point. It is an impressive piece of work. It is absolutely astonishing what kind Features and Connections they managed to fit in such a little box. The Processing Power also enables it to outperform similar devices in many ways. But all that Performance and Features come at a price. The QNAP costs about twice as much as the Drobo 5D3. In the end it really depends on your IT Tech capabilities and the projects your are working on which devices is the right one for you. Hello there, I didn’t found any information regarding the noise produced by the system. Can you tell me if it can be used in a silent environnement, at normal usage ( I can deal with extra noise at intensive usage ). it can be used in a quiet environment, but it is the second loudest device in the Thunderbolt 3 Storage Guide yet. Even when it’s idle I measured about 43 dB. So if you don’t have it standing right next to you, it should be fine. Remember Thunderbolt 3 cables are limited to 2m at the moment.